Third Day have been one of my favourite bands of all time. Alongside other poignant bands like Newsboys, MercyMe, Delirious?, Casting Crowns and more recently Stellar Kart and Tenth Avenue North that have influenced my life til date; these 4 men from Atlanta, Georgia have had an impact in both the Christian and mainstream music circles ever since their humble beginnings in 1992 when they decided to start a garage band called “Nuclear Hoedown” (they have since become one of the most influential CCM/gospel/southern rock bands in the modern Christian music era). Giving us songs like “Children of God”, “Your Love is Like a River”, “Sing a Song”, “Rockstar”, “Your Love Oh Lord”, “Revelation” and “Consuming Fire”; it is their new album that released March 3rd that showcases some of the most powerful songs they have ever written. A worship album and a sequel to their 2002 part-studio part-live album Offerings II, Mac, Mark, Tai and David continue to show us that it is God whom we need to be led back to, as we consciously choose to follow Him each day as we walk in His promises and truth in every deed we practice and word we speak. Traveling back to their rock/worship roots, this album as a follow-up to the somewhat unfortunately mediocre Miracle is a great infusion of gospel undertones and a lot of backing vocals with grunging guitar and a powerful purpose- to invite us all to worship God with abandon. Third Day’s 17th album is worth the wait (Miracle released in 2012)- one of the standout albums of the year, and one that reminds us that Third Day is not done with music yet. Even though they are currently one of the longest serving CCM bands that are still currently active (others include bands like Newsboys, MercyMe and Casting Crowns); they still have much more to give, with Lead Us Back giving us all a clear reminder of this. From the anthemic “In Jesus’ Name” to the poignant and gospel influenced “Father of Lights” and the soulful “Soul on Fire”; Lead us Back gives us impetus to believe that ‘…the blind have sight, the deaf now hear, the lame will walk, the lost draw near, and with new life, the dead are raised, all through the power in Jesus’ name…’ (“In Jesus’ Name”). Releasing their promotional single of “Our Deliverer” and their lead single “Soul on Fire” prior to album release date, it is by these two songs alone that longtime fans of the band and newer listeners of the group are encouraged to listen to more of the record (dare I say that by these two songs alone, I would’ve purchased the album had I not listen to any other track). With light piano that transforms into a powerful anthem full of guitar strums and a southern atmosphere, “Our Deliverer” encourages us that God is coming and that ‘…every burden one day will be lifted and every broken heart will be redeemed…’, and is a great promotional single, while the duet with worship group All Sons and Daughters creates a worshipful masterpiece in “Soul on Fire” (co-written with Brenton Brown and Matt Maher), a melody that captures the soul and rock of the track that is infused with the truth that we as Christians long for God to transform our lives and hearts to be burning for Him like a soul on fire. Third Day have a winner for months and years to come in both “Our Deliverer” and “Soul on Fire”, some of my favourite songs since “Children of God” and “Revelation”! Guest vocalists come aplenty on Lead Us Back, from the aforementioned “Soul on Fire” (All Sons and Daughters) to the powerful “Your Words” (backing vocals by Harvest Parker, sister of worship leader Daniel Bashta), a song about us longing to hear God’s voice in the midst of our lives above anything else that screams for our attention; and the emotive anthem “In Jesus Name”, with Natalie Grant, Michael Tait and Michael W. Smith each lending their voices to deliver a melody about proclaiming the power of Christ in every situation we are in. And despite the difference in tempo between these two songs- with “Your Words” being more of an upbeat and more energetic melody (with the piano introduction reminding me eerily of the introduction to Mandisa’s “Press On”), and “In Jesus Name” delivering more of a reflective atmosphere; both songs showcase a similar theme present through not only these songs but throughout the album as a whole- it is in Christ’s name that we can live our days not under the power of the circumstances we face, but under the truth that ‘…Your words give us life that’s never ending, Your words bring us love that never fails…’ (“Your Words”) and how ‘…the tired find rest, the sick are healed…all through the power of Jesus’s name…’ (“In Jesus’s Name”). With the band offering their first all-studio all-original tracklist full of worship songs, Lead Us Back brings with it fresh and unique melodies fit for any Sunday morning worship service, from the 3 minute opener “Spirit”, a song that invites us all to embrace the Holy Spirit as Mac uses repetition to his advantage as we hear the chorus of how we long for God to ‘…fill us with Your spirit, guide us by Your presence, how we need You, God…’ (against the backdrop of gospel-esque gang vocals and a hauntingly refreshing keyboard undertone), to the Resurrection Sunday themed “He Is Alive”, a song fitting to be sung on every Sunday (especially with Easter coming up) as Mac brings us all into declaring that ‘…He is alive, death is defeated, sin has retreated from the power of the Son…’ And while the title track only stands at a little below 90 seconds in length, Third Day still place poignancy within the bounds of the track as the band yearn for God to lead them back to Him. Another short melody, the acoustical album ender “The One I Love” brings the theme of faith to front and centre as the band brings us into the story of Peter being afraid when he was walking on the water, and reminding us that Christ is with us when we step out into the unknown. Known for their three minute pop/worship songs like “Otherside”, “Follow Me There”, “Revelation”, “Call My Name” and “Your Love Oh Lord”, the band continue in that frame in a further set of standout tracks, from “Father of Lights”, a heavy banjo infused track that reminds us all that God the Father of Lights ought to be praised for all He is and deserves to be, to the equally short and powerful “I Know You Can”, a melody full of eerily timed and unique echoes and a message of God giving us the strength to squash any doubt we may have about certain decisions and circumstances in our lives. “Maker” and “Victorious” round out the twelve tracks on the standard edition of the album, and both highlight God’s power in all situations that we face, while both songs bringing forth unique musical arrangements (“Maker” emphasising a banjo-acoustic sound once again a la All Sons and Daughters/Rend Collective; while “Victorious” brings the piano and the electric guitar more to the forefront as a quality worship song is birthed). The deluxe edition of the album further highlights the strengths and qualities of the band as a whole, with the majority of the deluxe edition tracks being live versions of fan favourites, from “Children of God”, “Mountain of God” and “Trust in Jesus”, to “Born Again” (featuring Karyn Williams instead of Lacey Sturm in the studio recording), older fan favourite “Offering” and recent fan favourite “Your Love is Like a River”). What can I say about the album and band that I haven’t said already? Fans of the band will enjoy the album. Newer fans will also love this album. 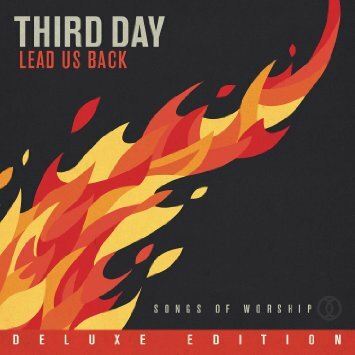 And I’m sure fans of music that may not necessarily be within the same genre or style as Third Day may also appreciate this album. Dare I say that Lead Us Back is in the running as being the Praise/Worship album of the year at this year’s Dove Awards? I will say it, because it has a great chance. Alongside worship/pop albums in 2015 like Jeremy Camp’s I Will Follow and I Am They’s self titled album, this quartet from Atlanta, Georgia show no signs of slowing down as they release some of their most lyrically profound and enjoyable songs I’ve heard since their 2008 album Revelation. One of my favourite bands ever (alongside Newsboys and Delirious? ), Third Day still have more years in the tank with their music ministry, and Lead Us Back is a testament to that. Well done Mac, Mark, Tai and David for such a powerful and prolific album, and one that’ll be on repeat in my iTunes playlist for years to come! RIYL: Newsboys, needtobreathe, MercyMe, Delirious?